Additional Info: 2 and 3 seater standing sofas. Built in full size fridge freezer. Built on veranda with sliding patio doors. parking space out front. We ask a £50.00 returnable deposit which also secures your date. It is NOT Returned it the holiday is cancelled on the customers part. The remaining balance we ask to be paid as and when you would like as long as its paid paid 3weeks before the date of the holiday . Thank you very much. 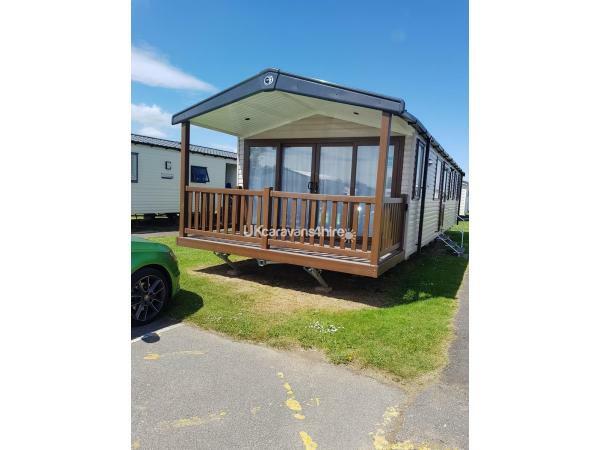 3 bedroom prestige 2017 Caravan on Haven Golden Sands Mablethorpe. Strictly No Smoking and No pets! Very close to all of the aminaties situated on Rowan Court. At the end of the row from the caravan there is go cart hire, next to that there is an arcade, mini supermarket and laundtette. In the arcade there is places to eat including a fish and chip bar and a pappa johns pizza take away. Through the arcade there is a football and basketball court, park, fun fair, in door and out door swimming pools and the main complex where the live lounge is and there is live entertainment for all ages all day. In there there is also the quay side restaurant. There is also fishing lakes 2 minutes walk away from the caravan on site and the beach is a 3 minute walk a away. Mablethorpe town centre is a 5 minute drive and an 30 minute walk. All breaks require an additional £50.00 returnable deposit which is returned once the caravan has been left as it was found. If the holiday is cancelled on the customers part the deposit will NOT be returned. Passes are NOT Included but can be purchased from reception on arrival. Check in is from 3pm day of arival and check out is at 10.30am day of departure. No reviews found. If you have recently stayed in this holiday home please leave a review, it only takes a few moments and will really help future guests when they are searching for holiday accommodation at Haven Golden Sands.